Bubba’s a lot like his mom and dad… VERY stubborn! When he makes up his mind to do (or not do) something, it’s very hard to get him to change his mind. With most things, his stubbornness is not that big of a deal (like when he makes up his mind that he wants to play with his train set). However, when he makes up his mind to NOT be potty trained, that stubbornness drives me crazy! I know that he’s more than capable of being potty trained! He can count higher and identify more letters than some of the kids in my 1st grade class, but he’s made it clear to us that he wants nothing to do with going on the “Big Boy Potty.” Sometimes I think he’s doing it just to mess with me! Like the other day… I sat him on the toilet, and he said he didn’t have to go (only to turn around and make me a present in his diaper less than 5 minutes after I let him get down from the toilet). I’ve read a few books about potty training to Bubba (and he always loves them), but I think I need to take a different strategy and completely immerse him in potty training literature! To do this, I’m going to need a bunch of titles, so I’d love to hear your recommendations! Please leave a comment below with the titles of potty training books that you think I should pick up! I recently got back from the Illinois Reading Conference, and was able to get a bunch of books signed for Bubba! I always store these signed books in our guest bedroom (so I can give them to Bubba as gifts when special occasions come along), but I’ve been adding so many signed books to this collection that I’m running out of places to store them all… I may need to get a bigger room! Needless to say, I had a good time… and I can’t wait to give Bubba these books at just the right time in the future! I Helped Get a Book Published! Earlier this year, I saw a Tweet about a Kickstarter campaign created by Lisa Seacat DeLuca that sounded pretty interesting. At the time, I had no idea what Kickstarter was, but I decided to check it out. Basically, Kickstarter is a way to help a project come to life by having people support the project financially – but the creator of the project maintains 100% ownership of the idea (and the people who support the project do not profit financially). 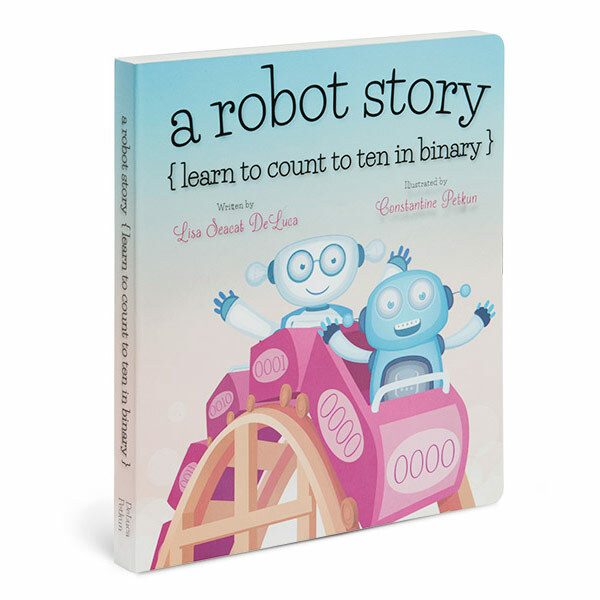 The project Lisa Seacat DeLuca was trying to get funded was titled, “A Robot Story.” After going to the website and reading all about it, I learned that she basically wanted publish a book that teaches children to count to ten in binary. How cool is that?! She was looking for just $2,500 to make the book a reality, and she had a number of different rewards for backing the project (like a board book, t-shirt, or e-book) depending on the amount of money you pledged. Needless to say, I (along with many others) made a pledge to her project, and her great idea eventually became a reality! About 4 or 5 months later I received a signed copy of Lisa’s new book in the mail, and it was so cool knowing that I (in some small way) helped make the book happen! I recently went on her Kickstarter website again to see what the final numbers were, and I was shocked to see that she ended up with 698 backers and raised more than $13,000 for her project. It’s truly amazing to see what can be accomplished when a bunch of people come together to support a great idea. If you’re interested in supporting a Kickstarter campaign like this, check out their website… As I’m writing this post, there are exactly 132 children’s book projects that are “live” and waiting to be funded! Sixty-four days. That’s how long it’s been since Bubba and I stepped foot in our library – more than nine long weeks! Obviously I’m still reading to him every night, but we’ve had a different source for books the past couple months… so we haven’t had to visit the library. I’m sure you’re probably wondering, “Where is he getting so many books if he’s not going to the library?” Well, I was able to start up a ‘Little Free Library’ in my school this year (thanks to a retired teacher who had been collecting gently used books for years as part of her “Book Shack” program), and I get to be the person who keeps the free library stocked with hundreds of gently used books! As I fill the shelves each week, I always find titles that I know Bubba will love… books about fire trucks, tractors, animals, and more! When I find a book I know Bubba will enjoy, I bring it home to read to him before putting it back on the shelf. And this works out great because I can then talk to my students about all the great (free) books that are available to them and recommend titles to my reluctant readers! The only problem is that I haven’t been taking Bubba to the library – and that needs to change! I’m not sure how I’m going to do it, but I think I need to either STOP borrowing books from the free library at my school or START reading more books to him each night before bed. Can you guess which option I’ll choose? I’ve heard the “Terrible Two’s” are nothing compared to the “Terrible Three’s,” and Bubba just turned three… so he must be in the “Terrible” sweet spot right now. Now don’t get me wrong, he’s a great kid most of the time, but when he gets mad, he definitely lets you (and everyone near you) know about it! Bubba knows there will always be a consequence when he behaves badly, though. Most of the time, he gets a time out… but when he’s really misbehaving before bedtime, he gets one of his favorite things taken away – he loses his read aloud time. I really hate it when he loses his read aloud time, because I enjoy reading to him just as much as he enjoys being read to… but just the threat of not reading a book before bed will usually cause him to start behaving again! Part of me thinks I shouldn’t use this as a punishment (because I don’t want him to have any negative feelings associated with reading), but the other part of me can’t help but notice how effective it is. There are days I wish I would’ve carved out some exceptions to the “rules” that Bubba and I are playing by when “reading the library.” I told myself we would read every picture book, but there are some books I would much rather skip. First on the “skip-able” list would have been all the princess (and other “girly”) books. I almost always struggle to get through these types of books (with one of the few exceptions being Victoria Kann’s Pinkalicious). 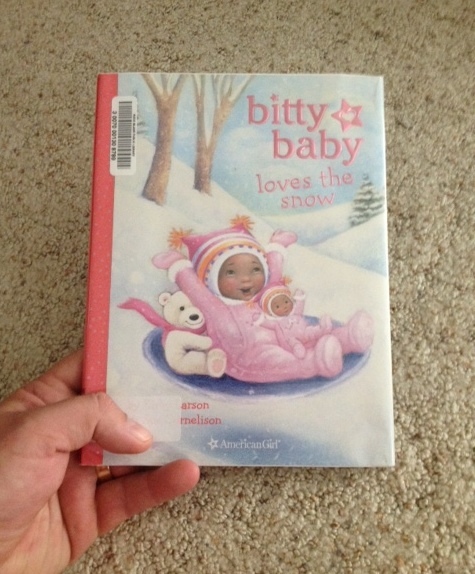 For example Bitty Baby: Loves the Snow. It’s an American Girl book, and it’s about a girl playing with her doll in the snow – all things that REALLY don’t interest me! I push through, though… and in this case, I’m actually glad I did! That’s right! As strange as it sounds, I’m actually glad I read an American Girl book! It’s not because it was a great book, though. I’m glad I read it because (while reading it), I came up with a cool idea for a winter activity with Bubba! In the story, the little girl wants to build a snowman but doesn’t get any help from her brother, so she ends up building a “snow caterpillar” with her American Girl doll. This got me thinking… Bubba loves The Very Hungry Caterpillar, so why not make a Very Hungry Caterpillar snow sculpture! We could find a way to color the snow, and we could use some math/science to build the arch portion of the caterpillar. Who knows, our snow sculpture might even inspire others to build snow sculptures based on their favorite books! I guess that’s why Bubba and I read EVERY book (even though it would be much easer to skip the “girly” books)… you just never know when inspiration will hit you! It could be on a hot summer day while reading and American Girl book that you come up with a great idea for a winter activity! If you could build a snow sculpture based on your favorite book/character, what would it be? Leave a comment below, and give us some more inspiration! Clutching. Whimpered. Famished. Escargot. Lavish. Indulged. These are just a few of the words Bubba and I came across today while reading picture books from our library. Obviously, these are words that Bubba would only be exposed to through picture books (my wife and I definitely don’t use words like these around the house), but that’s one of the main reasons I think it’s so important to read aloud to him. I’ve known for years that reading aloud to children is one of the best ways to build their vocabulary, but I’ve been reading a book for teachers, The Fluent Reader by Timothy Rasinski, that has me really focused on the subject lately. In his book, Rasinski dedicates an entire chapter to the benefits of reading aloud to children. He argues that one of the ways children benefit from a read aloud is they get to “explore sophisticated words and text structures.” Needless to say, since reading that section of his book, I’ve been noticing all the rich vocabulary and sophisticated sentence structures in the picture books that I’m reading to Bubba. It’s kind of crazy to think that picture books (written for children) use more sophisticated vocabulary than I use, but it’s true… and it’s one of the best reasons for reading aloud to kids!